Home › Learning Center › What is failure to thrive (FTT) and why can it lead to tube feeding? The term ‘failure to thrive’ is commonly used by the medical community, yet there is often some confusion about how and when it is used. Failure to thrive describes a child that fails to meet its growth expectations, and although often referred to as a diagnosis, it is only a descriptive term and word for defining the observed state. In medical literature we find the distinction between FTT (failure to thrive) and NOFT (non organic failure to thrive); in many cases there will be an interaction of both physical and interaction related causes of disturbance. There are several measures that define failure to thrive in infants. Most children are picked up when their weight does not increase at routine child health checks. The commonest definition in the UK is when the child’s weight drops two major centile lines on their growth chart. (Children’s weights are measured on internationally standardised growth charts which compare weights and heights to data collected from thousands of children from the USA, Norway, Ghana, India, Brazil and Oman in the World Health Organisation charts. There are several other growth charts in use). Other definitions of failure to thrive include having a body mass index or weight lower than the 5th centile (so in the bottom 5% for BMI/weight), having a length lower than the 5th centile, or weight for age/length less than 75% of the median, again compared to studies of thousands of other children. It is worth knowing that most of these studies excluded low birth weight children (less than 2500g when born at term) and may not be accurate for this group. Also that large-for-dates children tend to head towards average and may appear to have failure to thrive when they are actually following their expected trend. A good doctor will compare several measures and charts, as well as observing the child eat; and check developmental milestones and any physical signs before making a decision. A simpler definition of failure to thrive is malnutrition due to insufficient caloric attainment. This may be due to insufficient intake or supply, lack of absorption or excess bodily requirements. Lack of food may be due to parental neglect or inability to provide sufficient food due to poor knowledge, depression or poverty. Historically this was considered to be the cause of a significant amount of failure to thrive cases, however more recent studies have realised this accounts for fewer than 5% of children with failure to thrive. Some children have physical difficulties with eating, such as cleft palate, neuromuscular disease affecting chewing and swallowing, or genetic disorders such as Pierre-Robin Syndrome. In a large number of children the cause of reduced food intake is food refusal due to behavioural or eating disorders, these are multifactorial in origin. It is important for medical professionals to identify these and try to treat them before considering tube feeding. Some children are eating sufficient amounts of food but their gastro-intestinal (GI) tract does not absorb the nutrients properly. Common causes are celiac disease and other food allergies, these can cause diarrhoea on exposure to certain foods. Short bowel syndrome, where a child is born missing a portion of the intestine or GI tract (this more commonly occurs after surgery but can be congenital), pyloric stenosis, where the sphincter at the stomach is excessively large and powerful, causing the child to vomit often, violently feeds, and metabolic disorders where the child lacks enzymes needed to absorb or process certain nutrients. It is rare for these underlying medical problems to present purely as failure to thrive, as the children are often unwell with other symptoms, but they do need to be considered. The third reason is when the child’s body has higher energy requirements due to illness. In a normal child some weight stagnation is expected when they first become mobile, although they should soon learn to compensate for this and recover. In a similar vein if their body is using more energy to compensate for an underlying problem, they may struggle to gain weight. The commonest illness to cause this is congenital heart problems, and these children are often given a temporary feeding tube to boost their caloric intake before having corrective surgery. Lung disease, chronic infections and thyroid disease can all also present with failure to thrive. Current studies suggest at least eighty percent of children with failure to thrive have behaviourally caused eating disorders. While tube feeding can be essential in a child who is losing weight, we cannot stress enough the importance of diagnosing and treating the underlying cause specifically and, if tube feeding is needed, continuing to address the cause throughout the tube feeding process with clear treatment targets and plans for stopping. 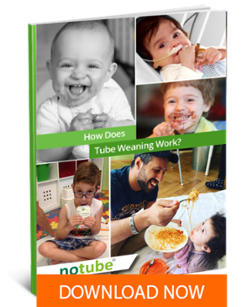 If you have a child who is tube fed, suffers from failure to thrive or your medical team have suggested it as a treatment to be chosen, feel free to contact us for advice about this or any aspect of tube feeding and weaning or feeding disorders.